I can't talk long! (This is how most phone conversations start these days.) But I did want to tell you about this meal we've been eating a lot of lately. I also want to say thank you for all of your thoughtful (and often encouraging) comments on the past couple of posts. Ready for it? Thank you! I was introduced to this salad dressing a long time ago via a coworker. She’d brought it into work and was dipping carrot sticks into it. I loved it immediately—it was bright with ginger and rice vinegar and yet umami-ish and satisfying. I asked about the recipe and was told it came from Goop. I’m loath to share that information because as much as I love Gwyneth’s hair, seemingly very genuine/unforced smile, and makeup-free-looking makeup and sometimes find myself staring at photos of her, wondering about how her specific brand of perfection, I’m usually not a fan of her detox-heavy, $$$, and trendsetting approach to food. 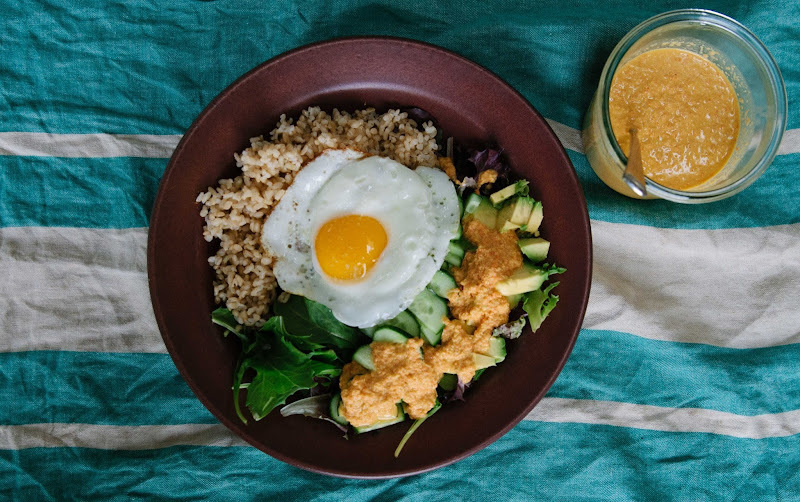 On that note: I'd originally made this dressing just as it appeared on her site, but one day I was out of miso and decided to sub in a combination of shoyu and sour cream. Yes, I added something from the much-maligned (at least in the diet world) major-food-group category known as dairy! But it was perfect and it’s definitely how I make it now. Point being, this is one of those healthy (at least to me) vegetarian meals that the whole family likes and that comes together fairly quickly. 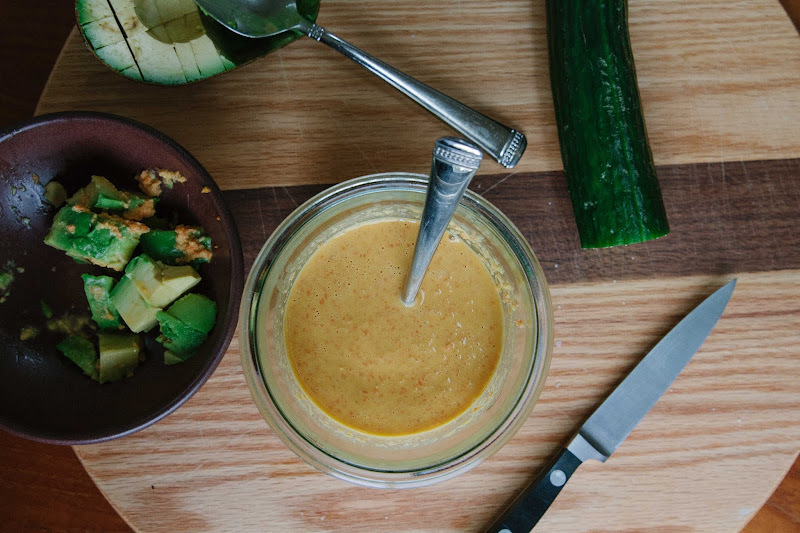 Also, go ahead and make a lot of this dressing as it keeps well in the fridge and you'll probably want to eat it for a couple of meals anyway. Lastly: if you want to see a video of Teddy and me making this meal, go here! Rinse the rice, and then cook it—either according to the package instructions or preferably, in your trusty rice cooker. While the rice cooks, make the dressing by pulsing the carrot, shallot and ginger in a food processor until finely chopped. Scrape down the sides, add the shoyu, vinegar, sesame oil, and sour cream, and whiz together. While the processor is going, slowly drizzle in the grapeseed oil. 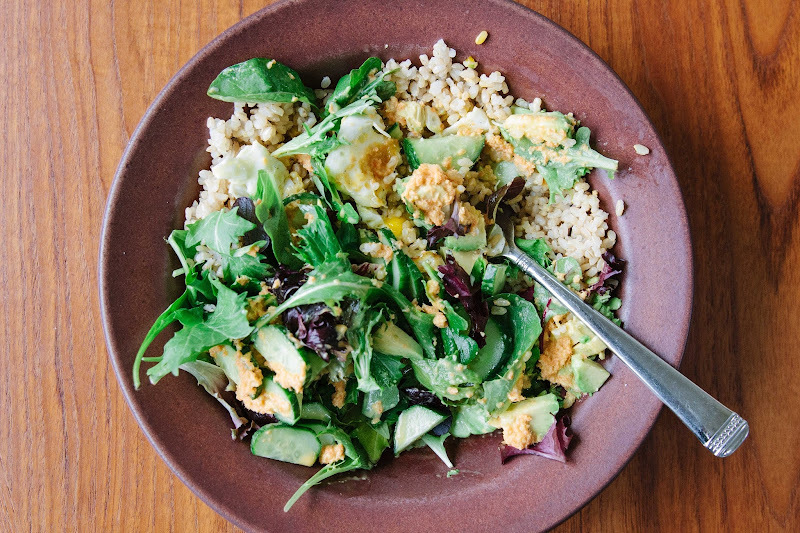 Divide the lettuce, cucumber, and avocado into four wide bowls. In each bowl, add a cup of the cooked rice right next to the salad. Add an egg to the top of the rice. Drizzle over a few heaping spoonfuls of the dressing onto the greens. Eat. In college I went to a restaurant all the time called DOJO on St. Marks street. They had the best dressing. I think Carmen Epstein actually bought it from them sometimes -- like she would bring a jar from home and they would fill it with dressing for money, though I could be way wrong about that memory. Anyway, this is that dressing! I think your blog posts are cosmically aligned with the contents of my fridge. I have all these carrots and knobs of ginger in the fridge, and no idea what to do with them. Now I know! There also happens to be three Persian cucumbers lying on the bottom shelf. Kismet! Oh, and I love rice bowls. Yum! This looks delish! I have GOT to finally buckle down and get a food processor. I've put it off for years and finagle using an immersion blender instead, but it's not ideal. What kind of food processor do you recommend? I want one thats easy peasy to clean! Love this dressing! I made it a couple weeks ago based on Smitten Kitchen's write up. But I'm intrigued by sour cream...need to try that. Loved the video--you look great! And then you need to fly here and tell me how to get my children to eat salad? I also would like some tips on how you get Teddy to eat this salad? You are a genius! Hang in there---those first few months with both kiddos are hard! I'm sure you are doing great! 1. Hi to all of the saras/sarahs! Congratulations on your new baby, Amelia! I had my first baby 18 days ago :) I'll be making this recipe soon. Just curious - which rice cooker do you own? I'm planning to buy one, so would love to know. Hi @ElizSeg -- I think you're right... For some reason, I got this super giant one that can cook a ton of rice even though I usually don't cook that much at a time. @Sarah I think any Zojirushi model will do--someone definitely just recommended that brand to me and I've been really happy with it. Be very easy and delicious to make this dairy free (dairy sends me to the hospital) by subbing coconut milk or coconut cream for the sour cream. Hilarious that Matthew remembers the Dojos dressing - I do too! Showstopper is right! Now I’m feeling like I should scrap the meal plan for next week and get this in my belly asap. The original Goop salad is a go-to for me, so I know I’m going to love this play on it!